Regular cleaning is essential to keeping a lovely area rug looking good. While there are numerous professional cleaning services available for this purpose, you can save money and give your rug personal attention if you hand clean it yourself. It is important, however, to use proper cleaning methods, to avoid damaging the rug in the process of cleaning it. Remove any stains you may have on the carpet. (See Resources for stain removal tips). This spot cleaning should be done, as needed, between cleanings to help keep your [rug](https://society6.com/rugs?utm_source=SFGHG&utm_medium=referral&utm_campaign=8775) looking good. Hang the area rug from a raised structure such as a deck rail or wooden fence. 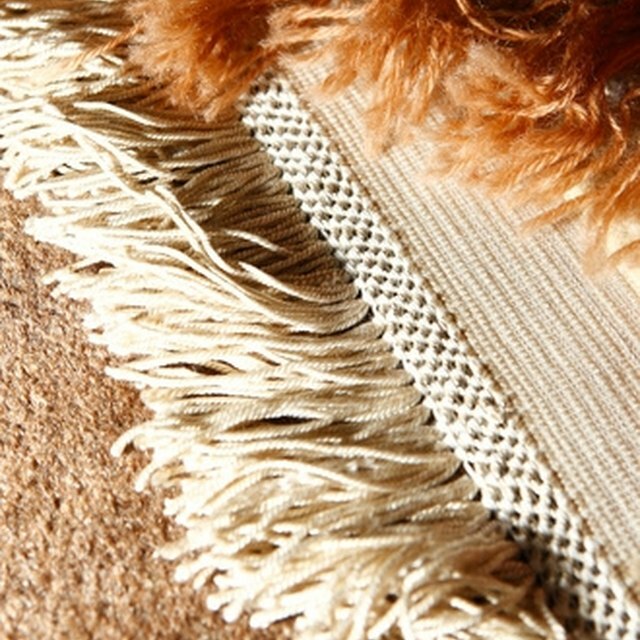 Use a rug beater, available from most carpet stores, to "beat" the dirt and dust from the rug. Turn the rug over and do the same for the other side of the rug. Transfer the area rug to a flat surface where you can wash it, such as a garage floor, driveway or deck. Spread the carpet shampoo onto the rug using a stiff brush, scrubbing in the direction of the rug's pile. Use the garden hose to rinse the rug off with cool water. Squeegee excess water off the rug and then hang it out to dry. Fill your bath with warm water and add some carpet shampoo. Vacuum both sides of your area rug thoroughly, and then loosely roll it up. Or, use a rug beater to remove the dust. Place the rug into the bath water. Step onto the rug with bare feet and stomp all over it for a few minutes to help work the soapy water into its fibers. Drain away the soapy water and replace it with fresh soap and water. Step onto the rug and stomp all over it again for a few minutes. Repeat these steps as necessary until no more dirt is coming off the rug. Hang the area rug out to air dry. Clean up any spills from the carpet straight away, before they have time to dry and stain the carpet. Check often to see if the rug needs cleaning. Rub your hand on the rug for a few seconds and check to see if it comes away dirty. Alternatively, kick the back of the area rug, and look to see if any dirt falls from it. You can also check the warp and weft of the rug's weave for any accumulated dirt that vacuuming may fail to remove.